Go is an ancient game which, from its forgotten origins in China, spread first to the rest of East Asia, and then to the entire world. How ancient? Historians aren't sure; it has a definite history of over 3000 years, but according to tradition Go was invented more than 4000 years ago. The English name comes from the Japanese name Igo, which means "surrounding boardgame". In this game, each player tries to use threats of death, capture, or isolation to assert control over more of the board than his opponent. 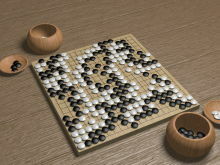 An abstract strategy game at heart, Go has nonetheless been interpreted as a stylized representation of fighting a war, settling a frontier, cornering a market, thrashing out an argument, or even of fortune-telling and prophecy. Go has always been one of the most played games in the world. Top-level international competitions can make the best players millionaires. Want to learn more? Maybe you would like to hear a few fun facts, read some great quotes, or learn the basic rules. If you want to know even more, why not look at the Reference Section? 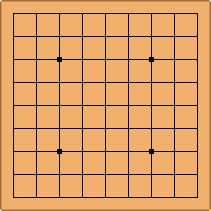 Go is played on a rectangular board like the one shown here. Players place their stones on the intersections of the lines. (The dots on the board have no effect on the game.) The board can be of any size, but a board with 19 lines by 19 lines is commonly used by advanced players and 9x9 and 13x13 by beginners. Many Go players cherish the craftsmanship of go boards, the smoothness and heft of the black and white stones (traditionally made of slate and shell), and the luster of the wooden bowls that hold them. Yet such is the simplicity of the game that it can be played with almost any materials, even something as simple as pebbles placed on lines scratched into the earth. As a strategy game, Go is often compared to chess. Despite its simple rules, Go allows for more strategy. Even though it takes a lifetime to master, Go is not difficult to learn, so it is easy to have a fun time playing the game with your friends. It was not until 2015 that computer programs could beat a professional player at Go. This diagram shows a game in progress. This game between Shusaku (Black) and Gennan Inseki (White) took place in July 1846. 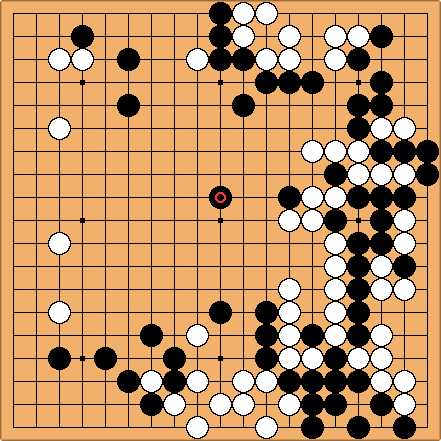 The marked black stone is the famous ear-reddening move, perhaps the most famous move in the history of go.